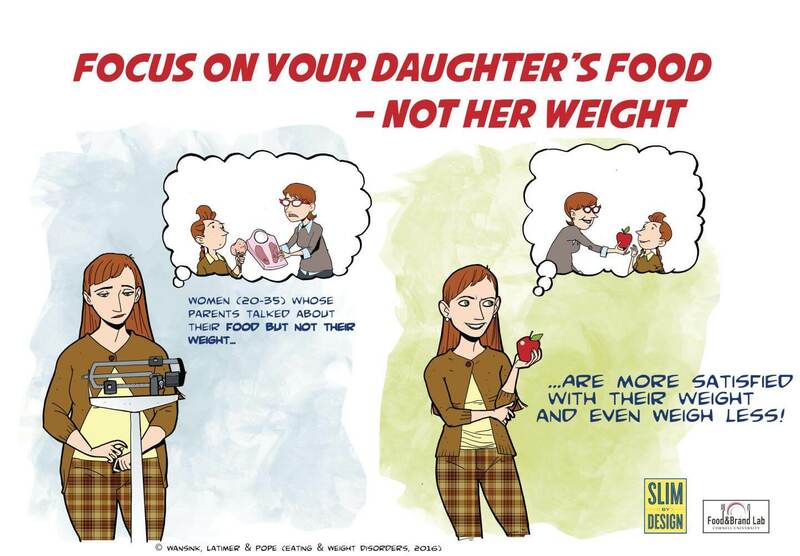 What happens when parents comment on their daughter’s weight? The less you comment on your daughter’s weight, the less likely she is to be dissatisfied with her weight as an adult according to a new study from the Cornell Food and Brand Lab. The findings published in Eating & Weight Disorders show that women who recall their parents commenting on their weight are more prone to being overweight and are less satisfied with their weight as adults. “Commenting on a woman’s weight is never a good idea, even when they are young girls,” says lead author Brian Wansink, PhD, and author of Slim by Design: Mindless Eating Solutions for Everyday Life. For the study, 501 women between 20 and 35 years old were surveyed about their body image and asked to recall how frequently their parent(s) commented about their weight. Those with a healthy BMI were 27% less likely to recall their parents commenting on their weight and 28% less likely to recall parents commenting on eating too much compared to women whose BMI indicated they were overweight. Importantly, both overweight and healthy weight women who did recall their parents commenting on their weight as youths were less satisfied with their weight as adults. This indicates that weight related comments were damaging to body image regardless of weight.